Large Hall; 10m x 10m with stage 5m x 4m. Click here and here for pictures of the hall, and here and here for the stage. Small Hall: 7.8m x 4.5m. Click here for a picture. Kitchen: This has serving hatches to both halls, and includes a range cooker, microwave oven, and fridge. Click here for a picture. Toilets: Ladies' and Gentlemens' and Disabled. 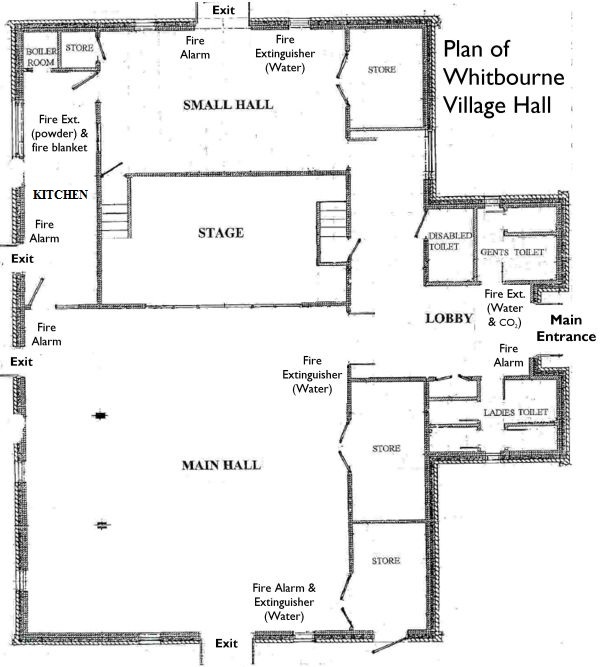 Access: With the exception of the stage, which has five steps, the building is fully accessible. Car Park: Space for 26 cars, plus a further two disabled spaces close to the main entrance. Click here and here for pictures. Click here for the inventory.